Since the announcement in April, 2011 that the DEAL WAS DONE to create the first shore power berth on the U.S. East Coast at the Brooklyn Cruise Terminal (BCT), it has been a slow, long wait for the Red Hook community wanting to see some physical proof that this plan was actually happening. Well, it is happening - though there have been a couple of "speed bumps" along the way. The change in the leadership of the Port Authority was one. In October, 2011, Chris Ward - a strong supporter of the shore power plan - announced he was leaving his Executive Directorship role at the PA and Pat Foye was coming in. After that change of leadership, the Port Authority started baulking at an extra $4.3 Million that was going to be required to get this plan up and running. "A few weeks back, there was the troubling news that that the Port Authority was balking at the revised cost of creating the shore power infrastructure at the terminal. They had okayed the original investment, but were questioning the extra amount that would be required. How much were we talking about here? According to this Brooklyn Eagle story (here), the shortfall was $4.3 Million. When the Port Authority has already made statements saying that this plan would save Brooklyn residents $9 Million per year - let me say that again - PER YEAR - in health costs. When those health costs include, as stated by the EPA and many others, asthma, cancer, premature death, lung and heart disease. When those who disproportionately bear this burden are our most vulnerable - our children (Red Hook's kids already have 40% asthma rates), the elderly, minority and low-income communities. Why is this even a question? Yes, the Port Authority is having budget problems, but on that matter they're talking about numbers in the billions of dollars. So to quibble over this relatively small amount, when the savings are so obvious and precious (we're talking about our kids here) - and knowing that the added investment pays for itself in 6 months - it seems very short sighted to be delaying this plan." Well, in June, 2012, the people at the Port Authority finally came to their senses and gave their approval to the extra funding (story here). The Brooklyn Cruise Terminal shore power plan was a go! The storm and the damaging flooding that inundated our neighborhood in October, 2012 threw a wrench in the works of everything that was happening in Red Hook. The shore power plan was no exception. With the new reality of potential flooding, threats to infrastructure, housing, economic activity and more on everyone's mind, there was a lot to consider. The entire future of Red Hook seemed uncertain. Many people asked in the last year or so, "Is the shore power plan happening?". "When is it happening?". We asked representatives of our elected officials for answers. The replies we received were all assurances that this plan was going ahead, despite the delays. But, people were still asking, "Where is the evidence?" Then Congresswoman Nydia Velázquez got involved. A letter was sent from her office to the Port Authority asking for an update on the progress. Their response came in May, 2013, in the way of a letter to Congresswoman Velázquez, (and CCd to many of our other representatives), stating that the Port Authority was announcing it was ready to "initiate the construction and installation of Shore Power Technology at the Brooklyn Cruise Terminal in Red Hook". They stated that the infrastructure would be ready "no later than the 2015 cruise ship season." View the entire letter here. Well that was good news, but - again - where was the evidence? Well last month, with Red Hook's future and resiliency looking better than ever, with new energy filling the neighborhood and an even greater sense of community involvement evident to all, the proof came that the Brooklyn Cruise Terminal shore power plan was truly happening. Now we have it. The physical evidence that the shore power infrastructure is being built and on its way to being completed, with the promise of it being put into service "no later than the 2015 cruise season", as the Port Authority has stated. This is great news for our community. 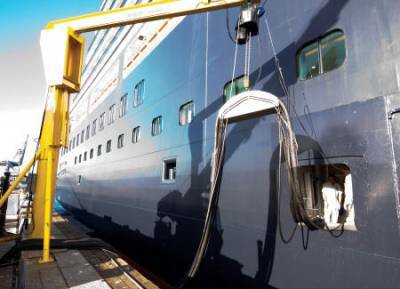 Finally, the cruise ships will be "plugging in" to the electric grid and will be able to stop idling their dirty diesel engines while in port at the edge of our dense residential neighborhoods. We'll all look forward to enjoying the improvements in air quality; the removal of the carcinogenic and asthma inducing substances that are emitted from those idling engines; improvements in the health of our children and the most vulnerable among us who are disproportionately affected by those pollutants; reduction in the burning of greenhouse gas creating fuels; and so many more benefits - both economic and environmental - that have been articulated in this blog over the last five years. We can now all believe it. In 2015, the Queen Mary II and other visiting cruise ships will finally be kicking their smoking habit, and the people of Red Hook and beyond will be breathing a little easier. Malta Today: Shipping's black cloud: "Rise in shipping pollution could end up killing 100,000s before new legislation is enforced"
Port Strategy: "it is in ports near where people live that human health is most affected"
Ship and Bunker: T&E says don't delay rule "[NOx] is an invisible killer causing cancer and lung disease"
Ship and Bunker: Latest California Cold Ironing represents"the single largest reduction in air emissions by one project in the history of the county"
Port Strategy: There is a shore power standard so "ports in the US can use the same system as Denmark"
Post and Courier: 1 Cruise ship idling in port = SOx "comparable to over 34,000 idling tractor trailers"- "Shore power is a must"
The Packer: "Shore power in port helps maintains cold chain, reduce emissions"
Washington Times: February is "SHORE POWER NOW" month in Charleston.